There’s a big shift happening in the world of consumer applications. The web is finally becoming a true visual medium. We are finally leaving the limitations of the early, text-based web and computers and embracing visual creative thinking. Want some proof? Instagram. Photo sharing mobile app with artsy filters sold to Facebook for 1 billion USD. 50 million users, popular among teens. Pinterest. One of the fastest growing social web sites, centered around visual bookmarking, easily beats Google+ on engagement. Draw Something. Insanely popular mobile game, making millions of users finger paint with a childlike joy. Something is going on. Back in the early days of the web (and computer science, of course) it was all about text. Text was easy to transfer over painfully slow internet connections. Just look at early HTML - all those tags were designed to define text. Just one <img> tag for images. Now, of course we have super fancy CSS style sheets that make almost any design you can come up with in Photoshop possible on the web without image hacks. And it’s not really a problem anymore to have an image heavy website. Yet a lot of the services we use daily are still heavily based around text. E-mail is of course an obvious example, but traditional blogs, even social networks like Facebook and Twitter have been designed around text. Text messages, status updates. But this is changing. Tumblr, a more visually oriented blogging platform, is becoming a more popular way to blog. And we create content for our Facebook and Twitter feeds with Instagram or Pinterest. This doesn’t mean that text is just disappearing. Of course not. Ugly websites are still great at getting the job done. It’s just that text is not in the spotlight anymore when it comes to user generated content. Photos and videos are much more fun to click on, seeing someone doing something is believing! Mobile devices are of course a big cause for that. Touching text on a touch screen phone or tablet isn’t as fun as pinching in on a high res photo. The new “resolutionary” iPad demands website to get prettier, and mobile apps are becoming little works of art. Mobile devices are of course making it easier to produce visual content. It’s never been easier to take a photo or shoot a video. Or even paint a sketch with our fingers in a fantastic app like Paper! We always have our mobile devices in our pockets, and we are finding that it’s actually easier to express ourselves visually than with text. A picture really is worth a thousand words. 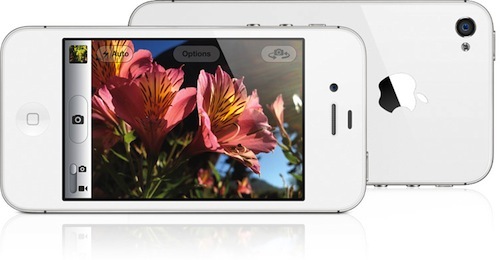 Is it any wonder that the camera is one of the most loved features of iPhone 4S? When I look at my Instagram history, each photo evokes emotions like no text-based status update can. I remember the moment more vividly, I remember how and where I was sitting or standing when I took the photo, and I can almost remember the full scent and touch of that moment…. Like it or not, vision has always been an important part of our species from an evolutional point of view. Writing is an artifact, while the ability to observe our environment with our eyes is deeply embedded in us. And we are just now learning a new visual language, a language that has historically been the domain of various visual artists and too difficult to master for common folk. But now anyone can take a photo with a mobile phone in a matter of seconds. No, it doesn’t mean everyone is an artist now, just like being able to write doesn’t make you a good writer. But I do believe we are witnessing a revival of visual communication. And consequently encouraging people to engage their creative parts of the brain. Instagram isn’t about logic, it’s about emotion. While the fact that we are writing less and creating images with fancy filters more might worry some, I do believe it’s a sign of progress. Our education has emphasized logic and shunned creativity for far too long. We live in a world of big problem that require big ideas. Not just logical ideas, but crazy, insane, passionate ideas. And that means engaging our creative side. Rediscovering intuition. Steve Jobs is a great example of how intuition can guide us towards great solutions. Yes, we need logic to develop the technology, but intuition and liberal arts are also valuable tools that can steer the technology into the right direction. And allow us to see and wonder at the big picture. To pursue beauty and value, not just revenue. Am I stretching it too far? Perhaps. I like to dream big. But something is going on. Tumblr, Instagram, Pinterest, Draw Something, Cinemagram, Viddy, Socialcam… these are not just coincidences. It’s an emerging trend we can no longer ignore. In fact, I think we all need to embrace it, and to foster the creativity in our kids, in ourselves. Teach ourself design thinking and creative problem solving. We all need to become a little more hungry and foolish to better prepare ourselves for the uncertain future ahead of us.